From Sparks, Nevada to Marysville, California. PayPal also accepts credit cards and does not require a PayPal account. Just click on the Add to Cart button above and follow the directions. You will go to a PayPal website, but there is an option to use your credit card and it won’t have anything to do with PayPal. If you would rather pay by personal check, an order form is on the “Trail Guides For Purchase” page. Be aware that ordering by check will add a week or two to your delivery time. This 109 page guide is only intended to be a Driving Guide so it does not include the photos, emigrant diary quotes and narratives that are found in the larger Guidebooks. The historic Beckwourth Trail remnants are visible at many locations and many can easily be hiked on. This feature provides an opportunity for the modern trail enthusiast to visualize the same settings that the early emigrants enjoyed. This guide covers the trail from its beginning along the Truckee River in Sparks, Nevada to its end in the old part of Marysville, California. 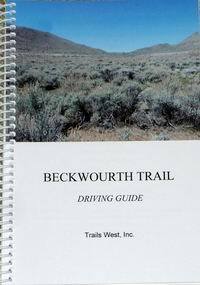 Included in the guide are trail route maps, detailed driving instructions on how to travel from marker to marker, GPS coordinates in Latitude/Longitude and UTM formats and a history of the Trail. For a photo tour of the Beckwourth Trail, click here.